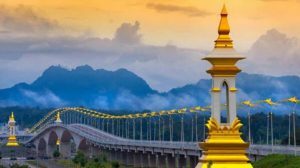 Nakhon Phanom (Thailand) – June 4, 2018 (travelindex.com) – Hosted by the Thailand Ministry of Tourism & Sports, the Tourism Authority of Thailand, and the Provincial Government of Nakhon Phanom, in collaboration with the Mekong Tourism Coordinating Office (MTCO), this year, from June 26-29, Nakhon Phanom will be the host of the 2018 Mekong Tourism Forum. Situated at the Mekong River, bordering to Lao PDR, the city in northeastern Thailand boosts Thai, Lao, and Vietnamese cultural influence, important Buddhist sites, as well as modern infrastructure and convenient road and air connectivity. This year’s theme is following the MTF 2017 theme of “Prosper with Purpose”, and the MTF 2016 theme of “Creating Authentic Experiences”. Travelers today are seeking a more transformative and soul-enriching experience. Tourism can be an important catalyst in changing people’s lives for the better through mutual understanding and acting more responsibly. The theme of “Transforming Travel – Transforming Lives” will start with a keynote by Jeremy Smith, editor of Travindy and author of the recent book “Transforming Travel”. The seminar on Buddhist Tourism will explore the power of transformative travel. As one of the fastest growing tourism segments in Asia, Buddhist Tourism not only draws international tourists into the GMS, but also boots domestic travel and contributes significantly to the local economies. Nakhon Phanom, this year’s host of the Mekong Tourism Forum and an important center of Buddhism in northeastern Thailand is the perfect destination to focus on Buddhist Tourism. The Experience Mekong Collection, featuring over 150 responsible and sustainable small businesses in the GMS, will showcase innovative case studies from each of the GMS countries. Small travel operators, giving back to local communities, promoting gender equality, and alleviating poverty is a key mandate of the Mekong Tourism Collaboration between the six member countries. The Experience Mekong Collection brings this mandate alive, and acts as a capacity building platform to educate other businesses how to adopt responsible and sustainable business practices. In addition to the six Experience Mekong Collection Showcases, presented in partnership with Mahidol University International College, some of the Experience Mekong Collection members will exhibit their services in the Mekong Marketplace. With MTF 2018, we don’t just want to attach a theme to the annual forum, but we want to live it. Senior travel executives from Ctrip.com, AirBnB, Air Asia, and Inle Heritage Myanmar will relate “Transformative Travel” to their respective industry sectors in inspiring 15-minute mini keynotes, before this year’s “Mekong Opportunities & Threats” session will focus on the relevant Plastic Pollution issue and invite anybody to join the discussion how the travel and tourism industry can reduce single-use plastic in the Greater Mekong Subregion. Single-use plastic is one of the biggest issues we face in today’s world, and the travel and tourism industry can do its part to help solve the problem. The 2018 Mekong Tourism Forum tries to do its small part to raise awareness of the issue and make the event plastic free. For the second year in a row, MTF 2018 has designed a limited-edition refillable water bottle, as part of the MTF 2018 Plastic Free Kit. The inaugural “Mekong Mini Movie Festival” will kick-off with a half-day Film Destination Marketing Conference, discussing the power of destination promotion via film, video, and visual storytelling, including keynotes by Rob Holmes of award-winning GLP Films to a case study of Hangover 2 at the Lebua Hotel in Bangkok. Following, delegates will be asked to judge some of the most inspiring films of the ongoing Mekong Mini Movie campaign. The Mekong Minis Awards Ceremony will announce the first set of winners of the Mekong Mini Movie Festival, and in partnership with WWF will raise awareness of the endangered Mekong Dolphins, the mascot of the Mekong Mini Movie Festival. For the second year, the Mekong Innovative Startups in Tourism (MIST) program will showcase some of the most innovative travel startups, with the potential to disrupt traditional practices, and provide solutions to key issues the industry is facing. Besides the half-day MIST Travel Innovation Conference, one of the highlights will be presentations by the best startups coming out of the recent 2018 MIST semi-finals. The Mekong Marketplace will showcase responsible travel operators from the Experience Mekong Collection, as well as feature the Blogger Matchup Lounge, as well as the MIST Startup Lounge. Organised by the Mekong Tourism Coordinating Office, the annual Mekong Tourism Forum gives stakeholders in the region, both public and private, a platform for joint discussions on the promotion and marketing of travel and tourism to and within the GMS countries – Cambodia, China’s Yunnan and Guangxi Provinces, Lao PDR, Myanmar, Thailand, and Viet Nam. MTF was most recently held in Thailand in 2012 in the northern province of Chiang Rai. Last year, the Forum was held in June in Luang Prabang, Lao PDR.